Cyprian Norwid Polish High School of Villard de Lans : What became of them? Others less well served by events or fate were unable to finish their studies. All of them however, benefited from the school’s character-building values and all, wherever they ended up, developed a feeling of mutual solidarity that neither age nor time could undermine. Villard was a second home to them, not only because they grew up and fought there, but also because the welcome they received in the village was so warm and understanding. Through Villard, they forever saw a France which, at a time of hatred and persecution, helped and protected them. 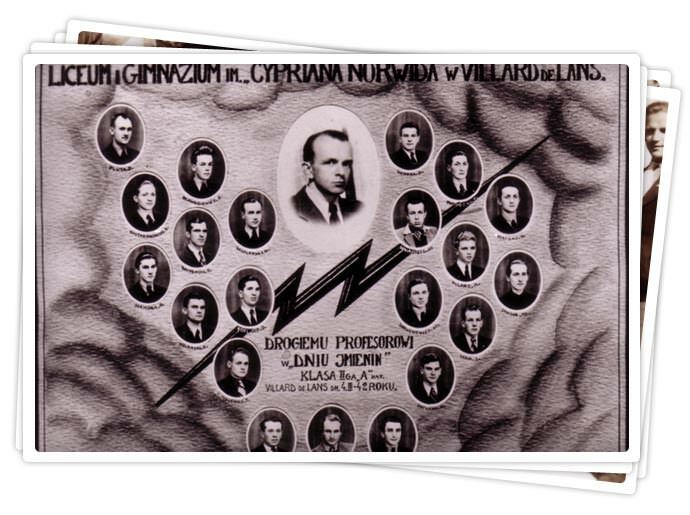 The Polish High School was also a school of culture and an academy for the Polish intelligentsia, where the future elite and builders of modern Poland were trained. It helped to spread knowledge of Polish culture to the children of Polish migrants, teaching them more about their home country and language. For all these reasons, the school’s former pupils and teachers, wherever they were and wherever their personal fates may have led them, felt a deep sense of unity with each other. They also felt at one with Villard-de-Lans, its inhabitants, its mountains, its meadows and its flowers. They knew that they were and would forever be tied to these people and this land. Consequently, they decided that they too would call themselves “Villardiens”, inhabitants of Villard. They wrote this name alongside their own on their certificates and business cards. And in this way, they paid the greatest of all tributes, and expressed the most heartfelt of thanks to those who had taken into their own homes these exiles, these people scarred physically and mentally, these people tempted by despair. They paid tribute to those who had put a roof over their heads. They paid tribute to those with whom they had spilled their blood. This great shared legacy is the foundation on which the Villardiens from Poland and the Villardiens from the Vercors plateau have built their friendship and the expression of their common humanity.